CAN YOU HELP IDENTIFY THIS TIME PERIOD? One of our librarians found this small sign in an antique store and brought it to my attention. Now I’m bringing it to yours. Does anyone know what this might refer to? Was it before the village of Schaumburg became a member of the Northwest Suburban Municipal Joint Action Water Agency (JAWA) and began receiving water from Lake Michigan in December 1985? The village was using a number of wells at the time. Was there a water shortage in Schaumburg before the pipeline became available? Or was this restaurant just being environmentally aware? If this rings a bell with you please leave a comment below or send me an email. The action by this restaurant is a new one on me! This is an aerial photo of the “W” Section of the Weathersfield development in 1959. It is at the corner of Schaumburg and Springinsguth roads. Some things stand out. The grading of Weathersfield Commons has already begun–or maybe that’s where equipment and trailers were kept during the construction process? There is a farm to the west–or left–of the development. And, then, there’s a small, white, circular disk in the lower portion that appears to be almost as big as a couple of the nearby houses combined. 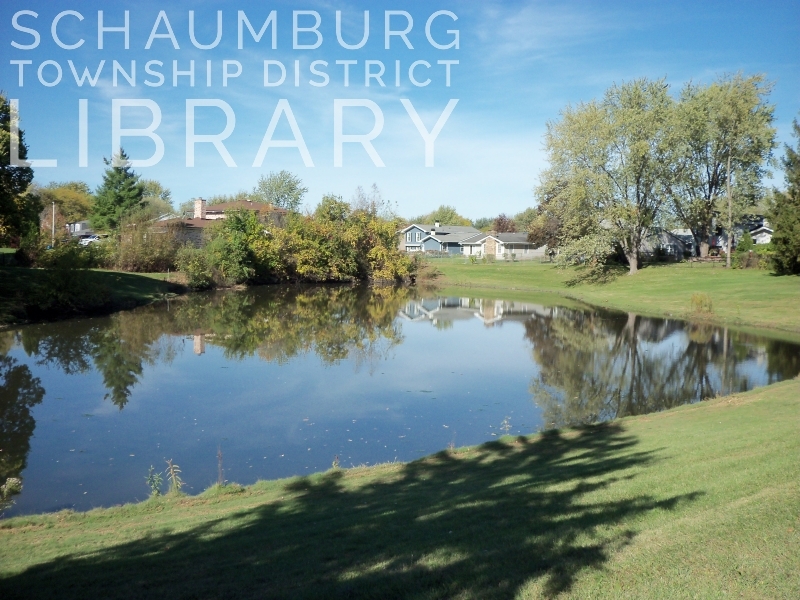 That disk is one of the first two community water reservoirs that were built in the newly incorporated town of Schaumburg. This reservoir is on property that is adjacent to Campanelli School. 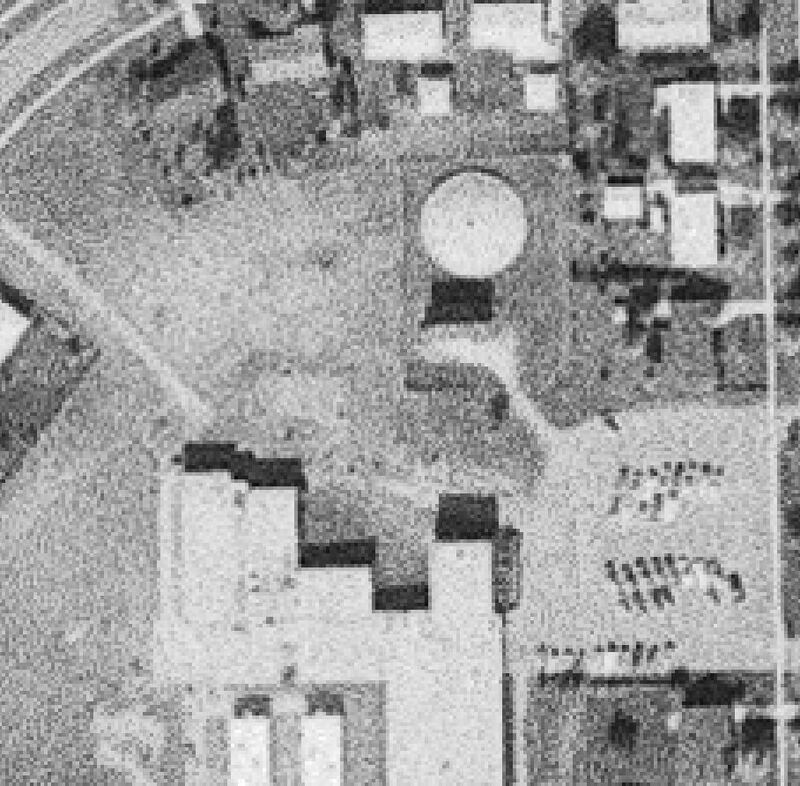 In this 1972 aerial photo contributed by John Kunzer who instigated this blog posting, you can see the round reservoir as well as the small building that housed the pump station directly below it. This is what is left today of that reservoir. When the village moved from a system of wells, storage tanks and pump stations in the 1980s to Lake Michigan water, the old water supply system was largely let go. This reservoir was filled in and torn down somewhere between 1997 and 2000. 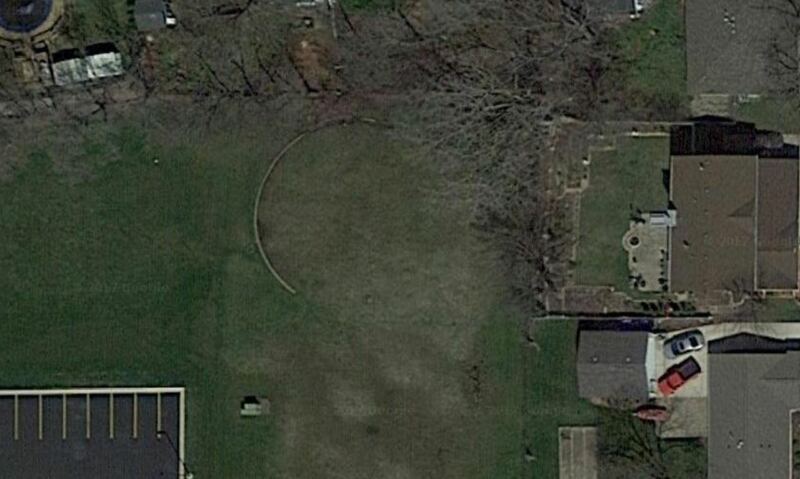 This Google image from Mr. Kunzer shows what remains today from an aerial view. 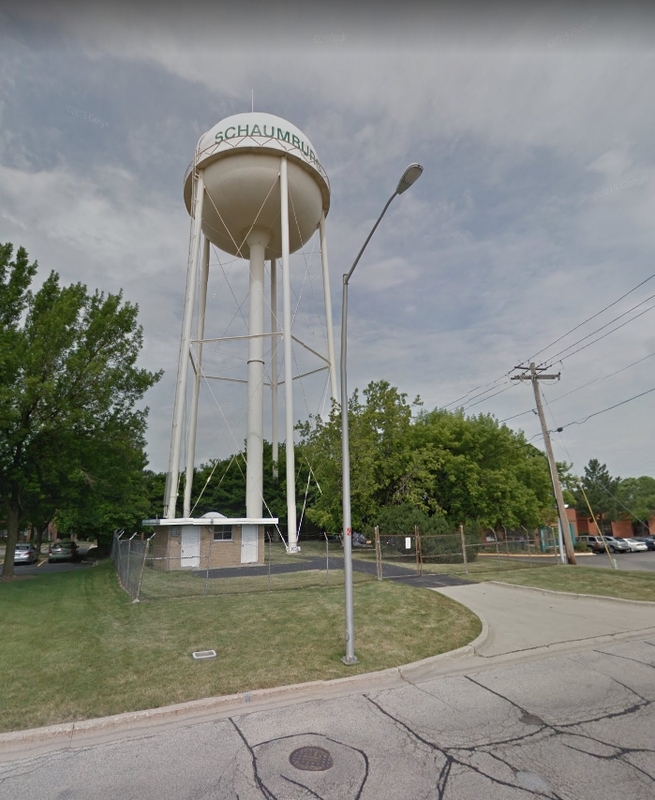 Do you have memories of any of the other obsolete water tanks in Schaumburg? Where were they located? Of course some tanks are still standing that are there in case of emergency. How about the big tanks off of Wise that say “HOT” and “COLD?” Can’t beat the village’s sense of humor on that one! The water in the shallow spring was so good and so fresh that they drove from Chicago to fill their jars and bottles. The drivers pulled over on the north side of Golf Road between Plum Grove and Meacham–closer to Meacham–and took advantage of the water that was bubbling up out of the ground. Once out of the car, it was just a jump across the ditch that bordered the road. In early years the drivers had to place their container close to the spring in order to fill it. Later, someone placed a pipe in the spring to channel the flow into the containers. This small artesian spring bordered a farm that Paul Engler and his wife, Nellie, managed for Frank Rathje, a well-known attorney. Paul and Nellie’s son, Bill, remembers the spring and how crystal clear and cold the water was. It was in a low area and, even if the summer was a dry one, the spring continued to flow. It only stopped for good when the Hoffman Estates water tower was built. The tower and subsequent demand lowered the water table that fed the spring. The geography of our township was impacted thousands of years ago by extensive glacier activity that distributed a great amount of rocky till (sand and debris) and left us a high water table. 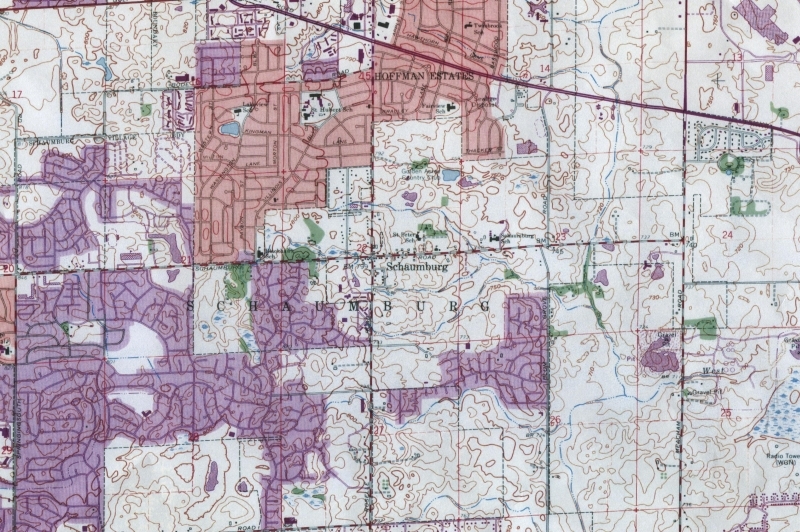 The artesian springs littered throughout Schaumburg Township were a direct result of water finding its way above ground because the pressure underground was greater than the pressure at the surface. These springs had a bubble or flow that was visible to the naked eye. There were also low areas where water continually seeped to the surface, forcing farmers to either get creative trying to contain the water or to tile their fields with drainage tile. 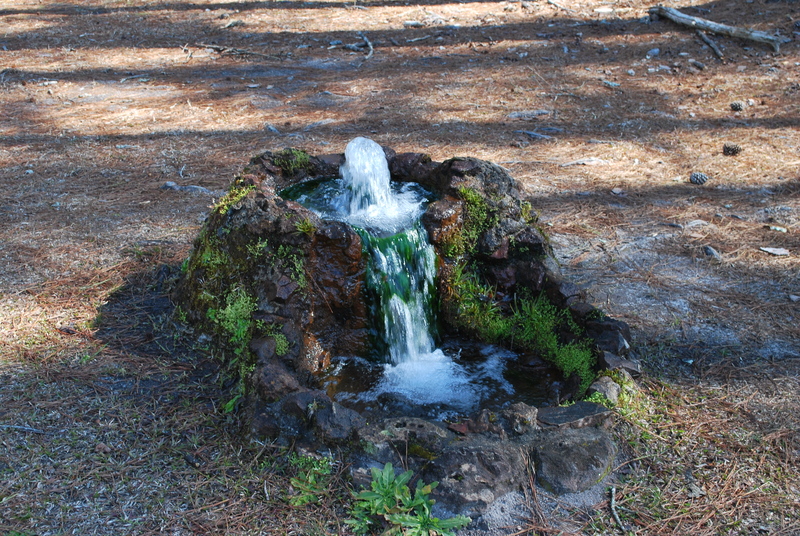 The area with the greatest number of artesian springs was appropriately named Spring Valley by Eleonore Redeker Ackerman and her Grandpa Boeger in the 1920s. Their Boeger ancestors were original land grant purchasers in the 1840s. 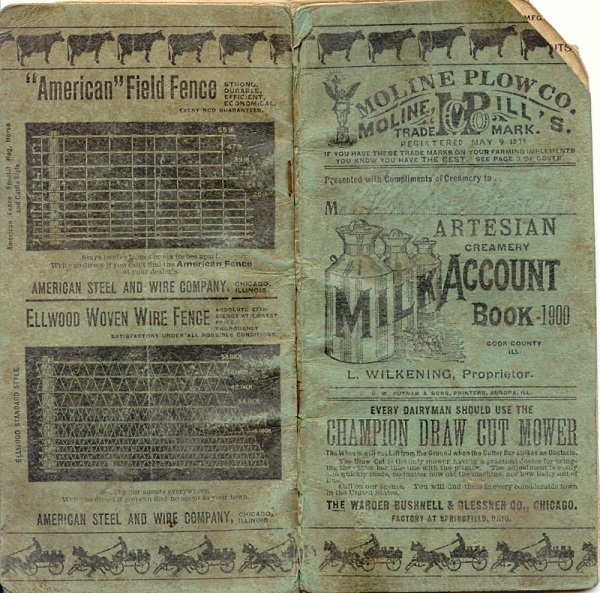 The first mention we see in print of this grouping of springs is on the cover of this 1900 farm ledger donated to us by LaVonne Thies Presley. 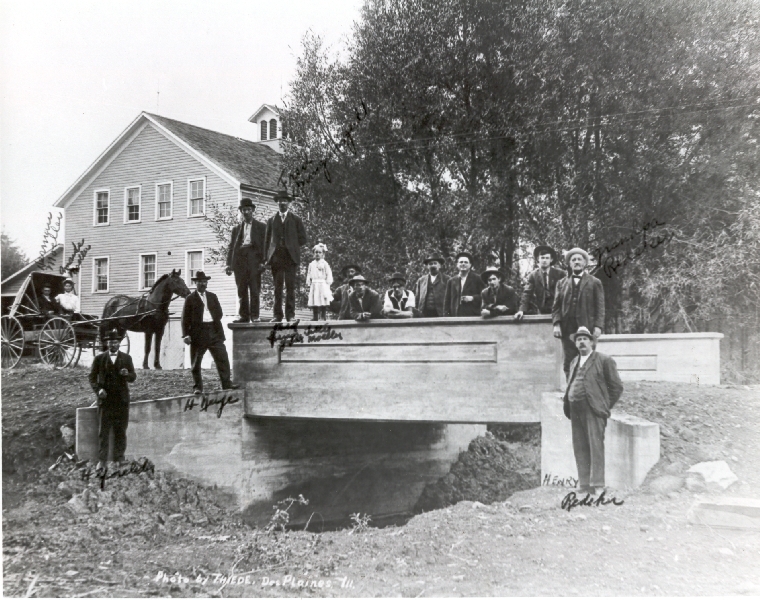 The Wilkening Creamery was built around 1898 on the small branch of Salt Creek that flows under Schaumburg Road through Spring Valley and is seen below. 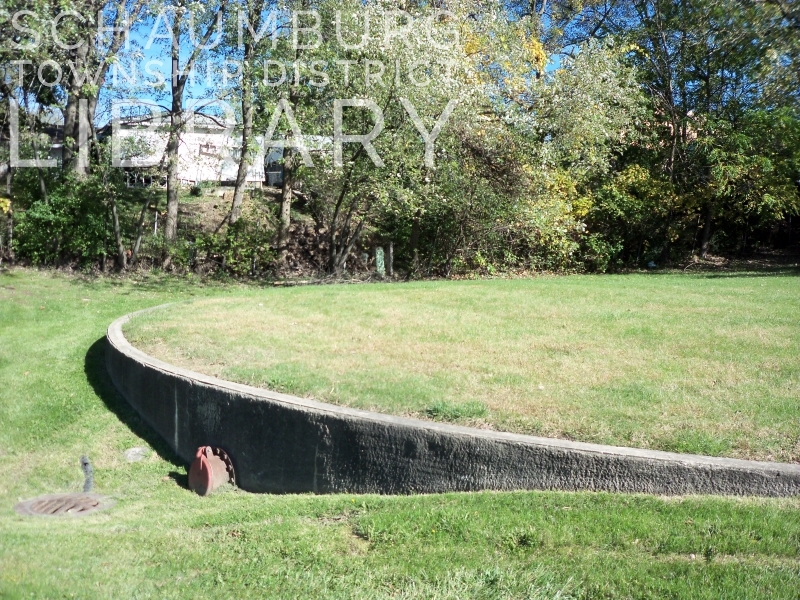 It was located on the north side of Schaumburg Road and one of the draws had to be the springs that were nearby. The springs provided unlimited cool water for this bustling creamery. Later, a portion of the Redeker property, which included the log cabin and the peony fields, was sold to Frank and Leona Merkle of Kenilworth. They used the property as a retreat. Their son William Merkle wrote about the farm in his book, Frank and Leona. The springs on the property clearly made an impact on him because he devoted a fair amount of space to them. 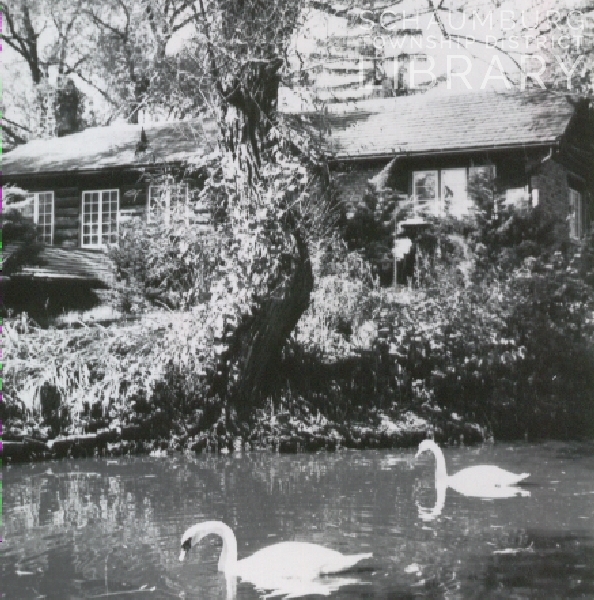 A picture of the log cabin and the pond during Mr. Merkle’s time that is part of the Spring Valley collection can be seen below. Another account of an open flowing spring was on Jones Road at its intersection with Highland Blvd in Schaumburg. Not only did the Jahn family who lived on the east side of Jones Road mention it, but the Hassels, who bought the property on the west side in the 1930s, also made reference to the spring. 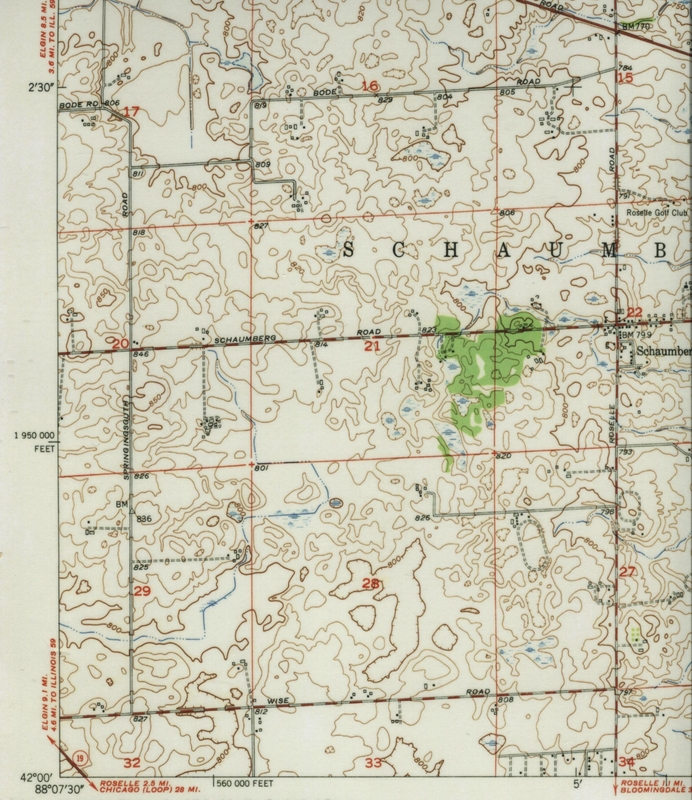 A 1953 topographical map shows this area with an active stream flowing through it and lowlands nearby. Pat Barch, Hoffman Estates Historian, recalls both family members telling her that the spring was very close to the northern most pond in Ray Kessell Park. 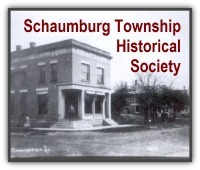 In LaVonne Thies Presley’s book Schaumburg Of My Ancestors, she discusses the low areas and natural springs that occurred on the Thies family’s farm on Meacham Road. (Their farm was south of the Fasse farm which is where the gravel quarry was located that inevitably altered the flow of the springs of Spring Valley.) The springs on the Thies farm became “more of a nuisance than a source of good water” because they kept the fields so wet. Coincidentally–and maybe not–this is not too far from the Schaumburg water tower that is on the portion of Wiley Road that parallels Meacham. In addition, a book called The Stolen Years by Roger Touhy, who was a bootlegger during Prohibition, recently came to my attention through Tom Holmberg, one of our reference librarians. When Touhy got his start in the practice of bootlegging beer he sought out a chemist who worked for the City of Chicago. “I asked him how to make good beer and, after giving me a lot of long words about enzymes and such, he said: “Good water, you want first of all. Fine pure water. Water is the big thing in all good beverages, from soda pop on up.’ I told him to go find the right kind of water, and he did. He tested water all over northern Illinois. Samples from my home town of Des Plaines were pretty good. There was better stuff in a creek out at St. Charles. But the elixir of all beer-base water was from an artesian well near Roselle, he said. I built a wort [the liquid portion of mashed or malted grain used in the production of beer] plant out there…” Was this wort plant in Schaumburg Township? Were the Touhy brothers taking advantage of the artesian wells in the area or was there a wealth of them in Bloomingdale Township, closer to Roselle? You have to wonder. 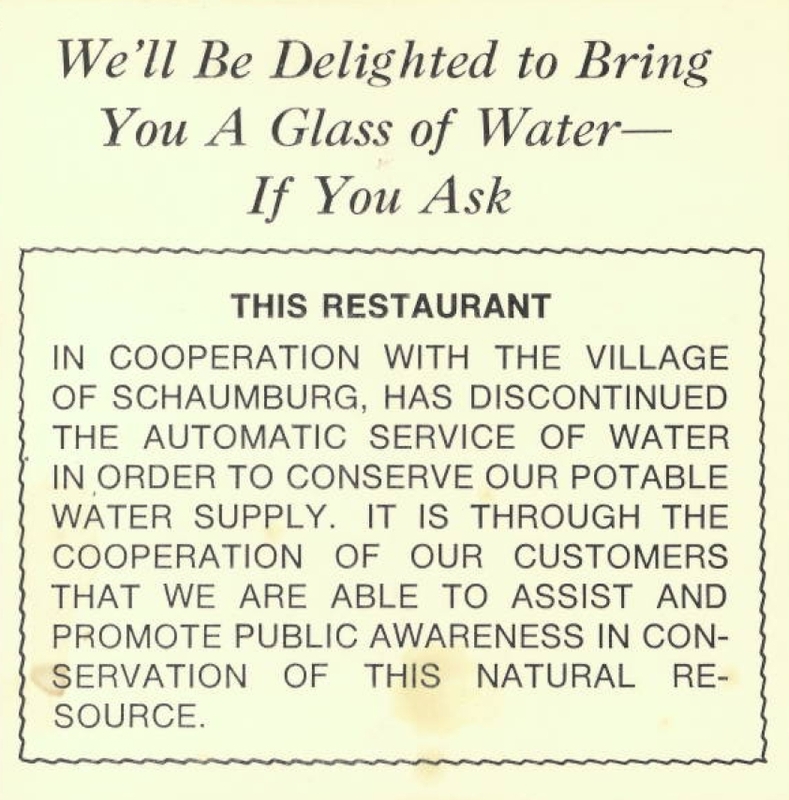 Water, water was everywhere in Schaumburg Township in the early days. Whether it bubbled, flowed or seeped, the farmers could count on fairly shallow wells that provided good, clear, water for them, their livestock and their fields. If you make a visit to Spring Valley you get a fairly good idea of how bountiful the water was before the building boom. It would be a pleasure to actually see those springs flowing at Spring Valley today, wouldn’t it? The photo of the spring is used courtesy of the American Sojourn blog. The photo of the water tower is used courtesy of Google Maps. If you enjoyed your geography or science classes, you probably know that the Continental Divide of the United States runs down the backbone of the Rocky Mountains. The streams and rivers on the east side of the Rockies flow into the Atlantic Ocean and those on the west side flow into the Pacific Ocean. Continental divides are naturally-occurring high spots that delineate how an area is drained of water. Interestingly enough, Schaumburg Township has its own small continental divide that runs north to south down the middle of most of the township. 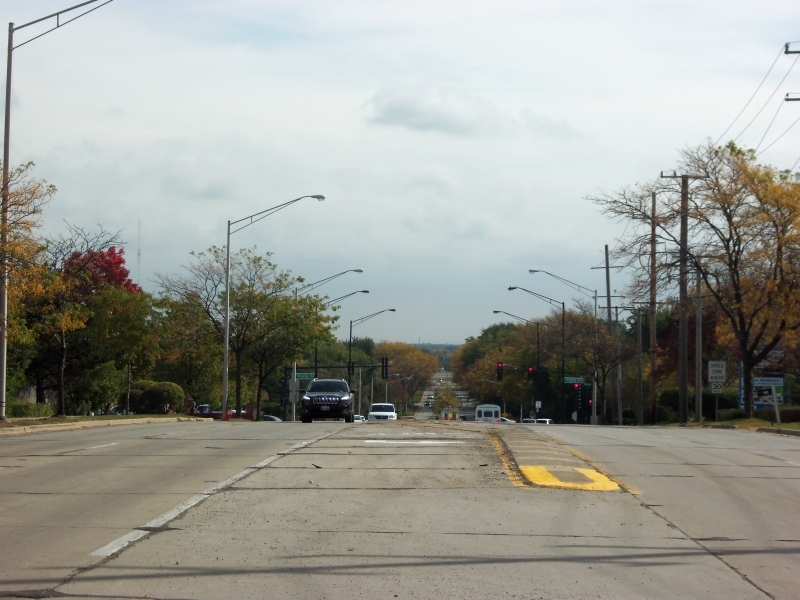 The divide and high point runs between Salem and Roselle Roads and is most noticeable driving east on Wise Road near Roselle Road. You know you’ve reached a high point because it is possible to see the skyscrapers of Chicago from the road. 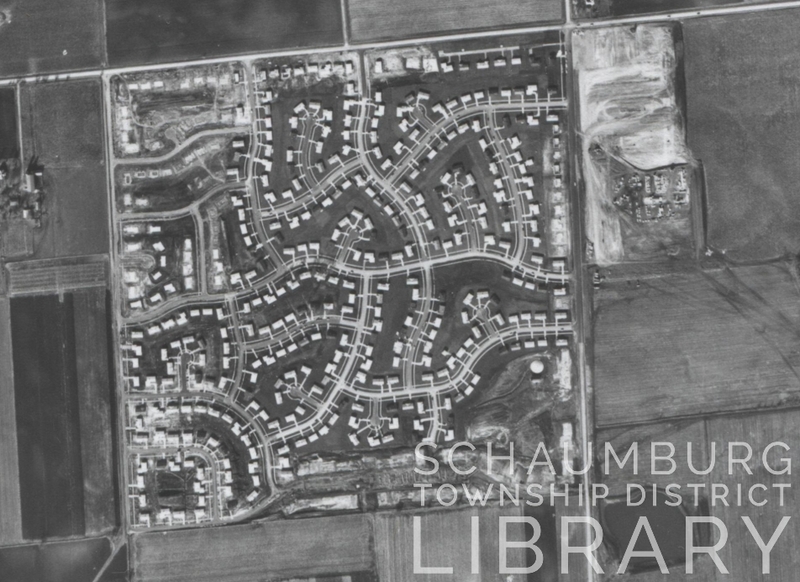 Below is a topographical map of part of Schaumburg Township. This map is part of the greater Palatine quadrangle and was redrawn in 1972. If you zoom in, you can see that on the east side of the divide the small streams that run through that part of the township drain into Salt Creek and eventually into the Des Plaines River. These would include the streams that run through Friendship Village, Town Square and along the southern border of the Schaumburg Golf Club. Yeargin Creek, which runs through the Schaumburg Municipal Center property, also drains into Salt Creek as do the creeks that run through the Spring Valley property. On the west side of the divide the streams are part of the Poplar Creek system that eventually drains into the Fox River. 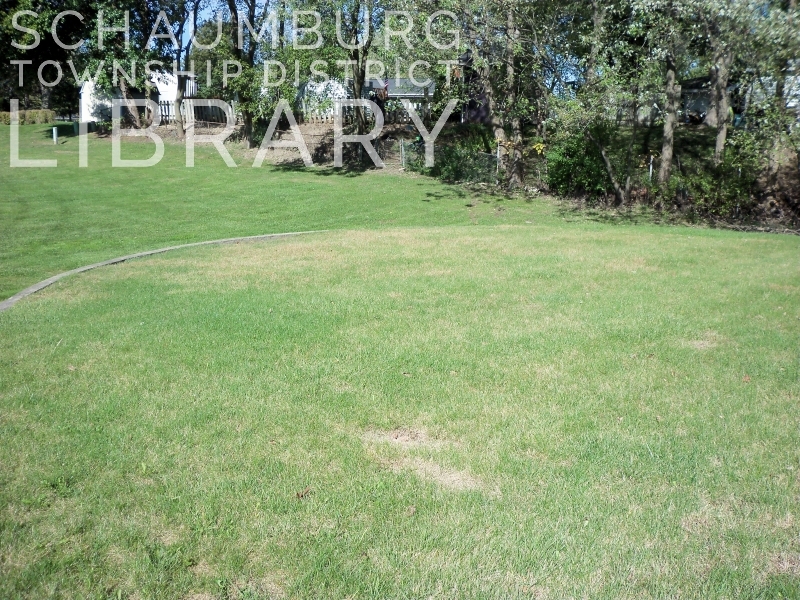 You can find these branches of Poplar Creek as they flow through the Hilldale Country Club, the Hoffman Estates Village Hall property, Poplar Creek Country Club and in front of the St. Alexius property that is close to Barrington Road. 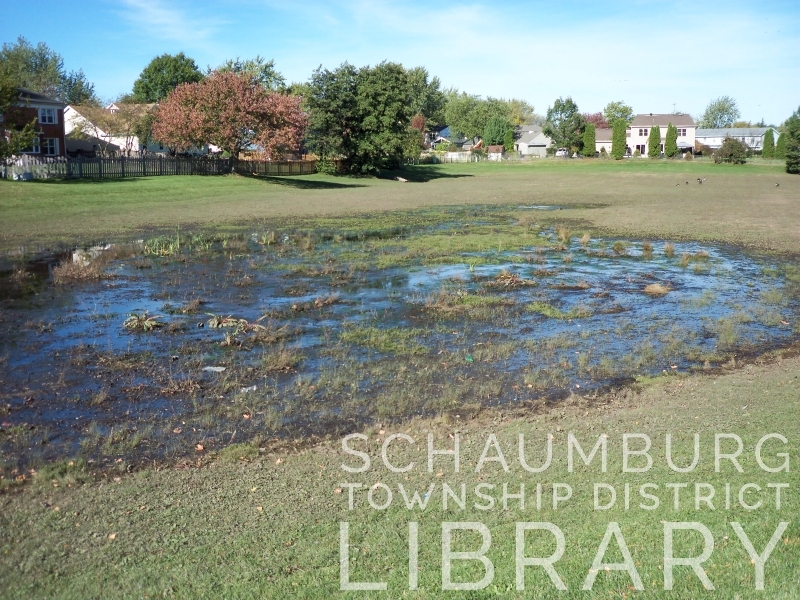 There is one exception to this continental divide drainage pattern in Schaumburg Township and that can be found in the southwestern part of the township. The West Branch of the DuPage River actually begins in Campanelli Park and eventually flows into the Des Plaines River. It drains south in Schaumburg along Braintree and then east along Syracuse Lane into Hanover Park. It takes a southerly turn at Anne Fox Park, flows under Irving Park Road and continues along Longmeadow Lane into the Metropolitan Sanitary District Basin and out of the township. Obviously, the continental divide does not come into play in this part of the township since we have an east-flowing stream on the western side of the township! 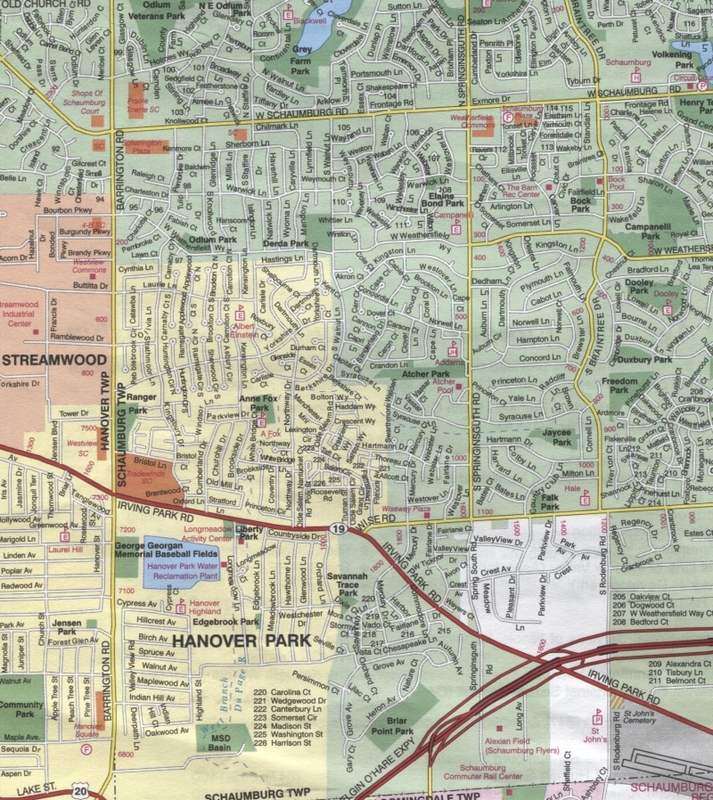 If you look at the map below, you can see the head waters of the DuPage River in Campanelli Park and the path that it follows through Schaumburg Township.